A visit to your local pool is a fun family activity that builds water confidence. There are some great facilities across Canterbury that are family friendly and the perfect place to burn off some excess energy. 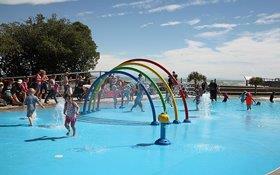 Swimming pools in the greater Christchurch area (CINCH). Christchurch City Council indoor swimming pools. Christchurch paddling pools open during the summer (CCC). Christchurch City Council outdoor swimming pools. Christchurch and Banks Peninsula beaches (CCC). Check the water quality at swimming locations around Canterbury (Environment Canterbury). Selwyn District Council's outdoor pools open during the summer. Selwyn Aquatic Centre in Rolleston. Waimakariri District Council's indoor and outdoor pools. The Amberley Swimming Pool is open during the summer. Pools in the Kaikōura District. Find out about the CCC SwimSmart membership programme that aims to help pre-schoolers, children and teenagers learn to swim and be water confident. Information about upcoming workshops, training opportunities, research and more. Information and resources to help your clients and patients become more active, more often. © Copyright 2015 Active Canterbury. All rights reserved.